When I was out shopping for my son's trip, which he leaves Friday for, I couldn't help but think.. They turned out pretty good! I then googled to see what others did in comparison, Jackie Topa is the closest to what I did, and she is just fabulous! Great minds! I used the Lucky Limeade as my greens and card base, layered Bashful Blue & Whisper White. 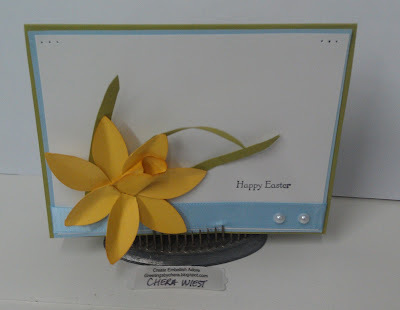 Pierced along the top in threes, added pearls on the Bashful Blue Satin Ribbon, and stamped Happy Easter just above. with family, friends and love. 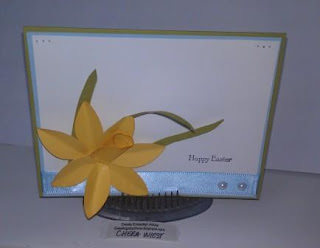 Very cute card, love the daffodil, never made one but I'd like to try. Cute Easter sentiment. Fun card. cute card...and you are not alone in having craft related ideas distract you from pretty much everything else! In fact, sometimes I have crafty ideas which distract me while I am working on crafty ideas which is probably why my stamp room is in a continual state of disarray! Chera, you are so good to share you samples with us all. So I've nominated your blog for the Liebster Blog Award. Visit my blog for details!! Love the daffodil, so cute!